Acid mine drainage (AMD) has received considerable coverage in the media of late and the number of short courses and workshops devoted to the topic has mushroomed. The current interest was prompted mainly by concern arising from the decanting of contaminated water from the old gold mines in the Krugersdorp area into the Cradle of Humankind. This led to the establishment of an interministerial committee on AMD in late 2010. As part of this initiative, a technical task group was formed to investigate the problem and to recommend possible solutions. The report was finalised in December 2010,1 and focused primarily on the immediate problems arising from gold mining and in particular on the now defunct mines in the Western Basin (Krugersdorp area), the Central Basin (Roodepoort to Boksburg) and the Eastern Basin (Brakpan, Springs and Nigel area). However, the problem of AMD is of far wider extent and to understand it in its entirety it is necessary to take a much broader geographic view. Acid mine drainage (also sometimes referred to as acid rock drainage) is a well-understood process2 and arises primarily when the mineral pyrite ('fool's gold' or iron disulphide) comes into contact with oxygenated water. The pyrite undergoes oxidation in a two-stage process, the first producing sulphuric acid and ferrous sulphate and the second orange-red ferric hydroxide and more sulphuric acid. Pyrite is a common minor constituent in many mineral deposits and is associated with our coal (it is the main host of sulphur in coal, the source of acid rain) and the gold deposits of the Witwatersrand Basin. During normal weathering of these mineral deposits, acid is produced but at a very slow rate, so slow that natural neutralisation processes readily remove the acidity. However, during mining and mineral extraction, the rock mass is extensively fragmented, thereby dramatically increasing the surface area and consequently the rate of acid production. Certain host rocks, particularly those containing large amounts of calcite or dolomite, are able to neutralise the acid. But this is not the case for our coal and gold deposits and in these the natural neutralising processes are overwhelmed and large quantities of acidic water are released into the environment by mining activities, initially into the groundwater and ultimately into streams and rivers. The acidic water increases the solubility of aluminium and heavy metals which may be present in the affected region. The overall effect is to render the water toxic to varying degrees. Ultimately, the water becomes neutralised by a combination of dilution and reaction with river sediment or various minerals in soils, but certain constituents have relatively high solubilities and remain in the water, particularly sulphate. Not all of South Africa's mineral deposits are afflicted by acid production: diamond, iron, manganese, chrome and vanadium mines do not generate acid-producing wastes and the majority of our platinum mines also seem to be free of this problem. The overall impact of AMD is very much dependent on local conditions and varies widely, depending on the geomorphology, the climate and the extent and distribution of the AMD-generating deposits. To appreciate the impact of AMD on South Africa, it is therefore necessary to briefly consider these other factors. 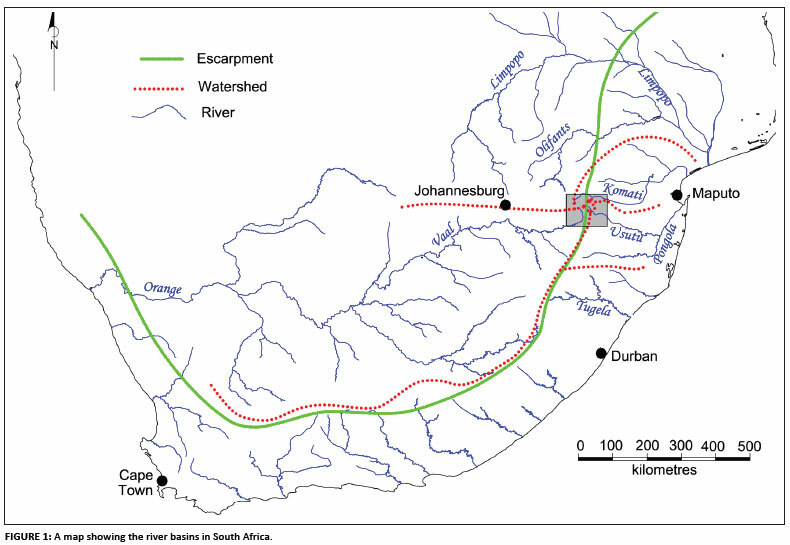 The river drainage network in South Africa is very asymmetrical (Figure 1). The Vaal and Orange rivers rise almost on the eastern escarpment and flow across the entire country to discharge into the Atlantic Ocean. The other major drainage is the Limpopo-Olifants River system, which drains the northern portion of the country and discharges into the Indian Ocean. Most of the remaining rivers drain the escarpment and coastal areas and have relatively small catchments. The Vaal is by far our most important river because it supplies water to the economic heartland of the country, not only in the Gauteng region but as far afield as the mining districts of Welkom, Sishen and Postmasburg. It is already over-utilised, necessitating interbasin transfers from the Tugela (via the Tugela pumped storage scheme) and the Orange rivers (via the Lesotho Highlands scheme). There are also some imports from below the eastern escarpment. Climate is an important variable in determining the impact of AMD. South Africa has a very pronounced east to west climatic gradient - rainfall decreases from over 1000 mm per annum in the east to less than 100 mm per annum in the west, and potential evapotranspiration increases from about 1500 mm per annum in the east to 3000 mm per annum in the west. Most of the country therefore experiences a negative water balance (i.e. evapotranspiration > rainfall). The higher rainfall region in the eastern and central Highveld is thus the major source of water for the Vaal River system, with very limited additions in the drier west. 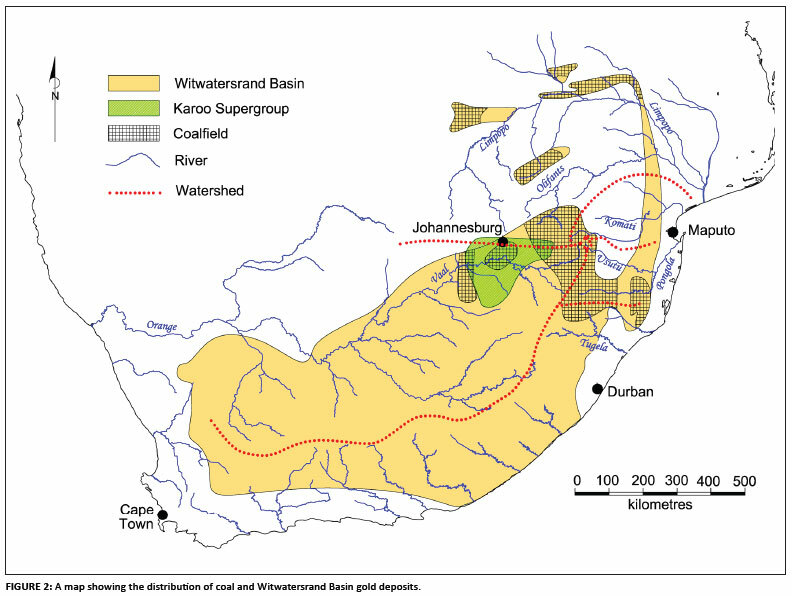 The distribution of the coal and the major gold fields of the Witwatersrand Basin are shown in Figure 2. A large proportion of the coal deposits and all of the gold deposits lie within the Vaal River catchment. The upper catchments of the Vaal and the Olifants rivers in particular are extensively underlain by coal deposits. This coal-rich region has the highest rainfall in the Vaal catchment. As mentioned earlier, the mining process increases the exposure of pyrite-bearing rock to oxygenated water (derived from rainfall), resulting in acid generation. 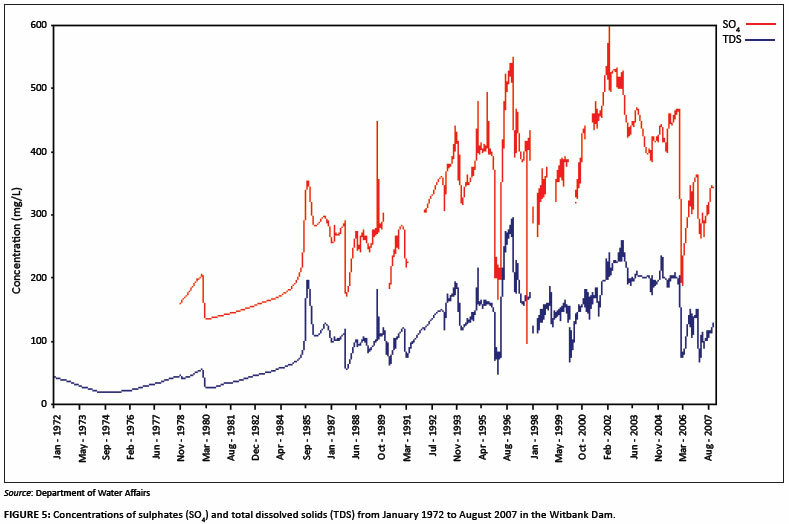 This occurs in different ways in gold and coal mining. Witwatersrand gold occurs in layers of conglomerate rock which form part of the approximately 7000 m thick sequence of sedimentary rocks of the Witwatersrand Supergroup. The layers average about a metre in thickness. The conglomerates are not uniformly gold-bearing and only in certain localised areas is gold present in economically recoverable concentrations. These areas form the goldfields. Within any individual goldfield, only a few of the conglomerate layers have been mined. The process of mining involves extracting the gold-bearing conglomerate layer and transporting it to the surface where it is crushed and the gold is extracted. Some conglomerate is left unmined to provide support for the workers underground and also because gold concentrations may be insufficient to justify extraction. After extraction of the gold, the crushed rock is deposited on waste heaps known as slimes or tailings dumps. The conglomerates typically contain about 3% pyrite, which ends up on the dumps. Rainwater falling on the dumps oxidises the pyrite, forming sulphuric acid which percolates through the dump, dissolving heavy metals (including uranium) in transit, and emerges from the base of the dump to join the local groundwater as a pollution plume. This polluted water ultimately emerges on surface in the streams draining the areas around the dumps.3,4,5,6 Streams draining the tailings dumps are therefore typically acidic and have high sulphate and heavy metal concentrations. Water is continually seeping into the mine workings from surrounding groundwater and this has to be pumped out to prevent flooding. Some of the water is used in the mining operations and the rest is discharged into streams after basic treatment (if necessary). Once mining operations cease, pumping also ceases and the void created by mining slowly fills with water. This water originates as rain and contains dissolved oxygen. In its slow passage through the old workings it becomes acidic and enriched in heavy metals. Once the mine void fills completely, decant of this polluted water commences. Decanting will occur from the lowest-lying opening to the old workings, as is currently taking place from the Western Basin mine void in the Krugersdorp area. South African coal occurs in layers within sedimentary rocks of the Karoo Supergroup. These are widespread, but coal is restricted to the areas shown in Figure 2. The coal is extracted either by underground mining or by opencast methods. Unlike gold mining, the coal is removed from the site and there is very little surface dumping. Both the coal and the host rock contain pyrite, but it is generally more abundant in the coal layers. Underground mining results in collapse of the overlying rock strata and when mining terminates, the voids in the fractured rock fill with water and decanting occurs from the lowest opening. The water is acidic as a result of its reaction with pyrite in unmined coal and in the host rocks. Opencast mining involves blasting and removal of the rocks overlying the coal layer, which is removed completely. The fragmented cover rock is then replaced (backfilled) and covered with soil and the terrain is landscaped ('rehabilitated'). Rainwater penetrating through the soil into the backfill becomes acidified by pyrite in the backfill material and ultimately decants on the surface. Decanting generally commences a decade or more after mining ceases.7 Opencast mining destroys the natural groundwater regime and radically alters the nature of groundwater-surface water interactions. Gold tailings dumps have been a feature of the landscape around the large gold mining towns since mining began, and as described above, have been discharging polluted water for decades. The effect of this so-called diffuse pollution has been particularly pronounced in the case of the Blesbokspruit in Springs and the Klip River (which drains the southern portion of the Witwatersrand escarpment) because tailings dumps abound in their upper catchments. The gold mines on the Witwatersrand closed over a number of years, and as each mine closed and ceased pumping, water began to accumulate in the void and was then discharged into neighbouring mines because of the high degree of connectivity of the mine workings. The neighbours were thus forced to shoulder the pumping responsibility. The government introduced a pumping subsidy to assist mines with the cost of pumping this additional quantity of water. The water was generally of low quality, necessitating basic treatment. This treatment consisted of adding lime to raise the pH and blowing oxygen or air into the water to oxidise the iron, which precipitated, taking with it most of the other heavy metals. The iron was then allowed to settle and was separated and disposed of on tailings dumps and the water was discharged into local rivers. The discharged water was clear with a neutral pH but had a very high sulphate concentration (about 1500 mg/L).8 These so-called point sources further added to the pollution load already carried by the rivers in the mining districts. 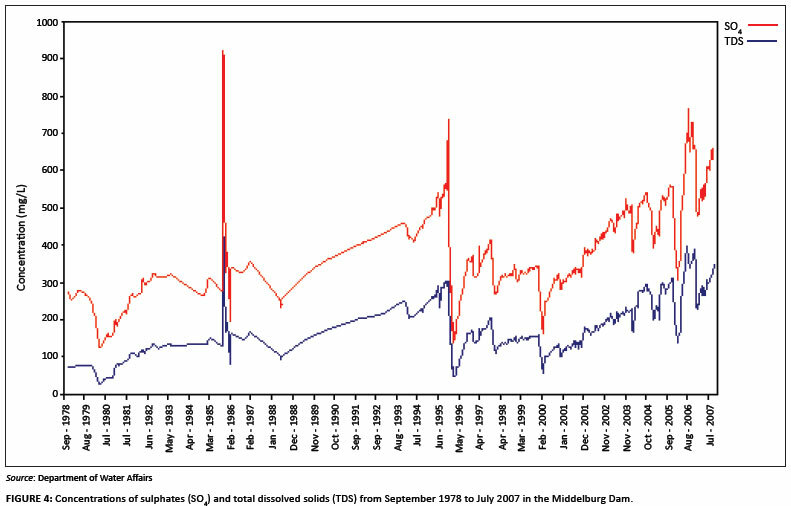 The effect of the diffuse and point source pollution arising from gold mines of the Central and Western basins is well illustrated by the salinity of the Vaal River, which more than doubles between the Vaal Dam and the Barrage (Figure 3) as a result of the inflow of water from the Klip River and the Blesbokspruit (via the Suikerbos River). 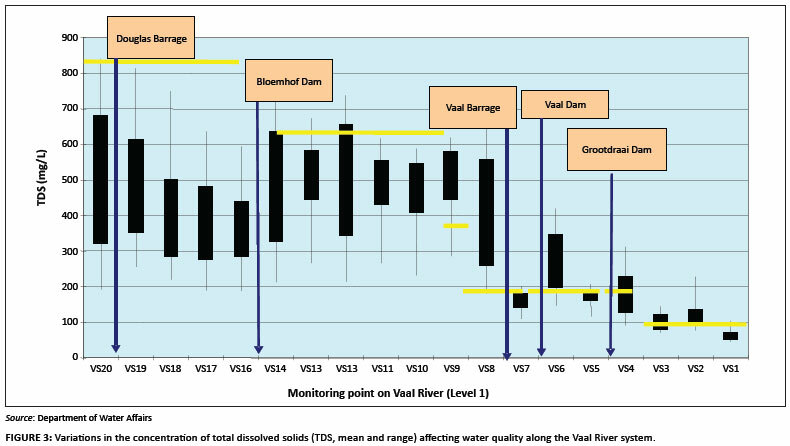 The low quality of water at the Barrage necessitates the periodic release of water from the Vaal Dam to reduce the salinity for the downstream Vaal River users. During wet periods, such as the current situation, this poses no problem, but it could become critical in a drought situation when water in the upper Vaal system, which should be conserved for Gauteng users, has to be released purely for dilution purposes. Coal mining in the Witbank/Middelburg area commenced in 1894 to supply coal to the growing diamond and gold mining industries and this region therefore provides insight into the longer-term impacts of coal mining. Many mines in the region lie abandoned; some are on fire, some have collapsed and most are decanting acidic water. The water is entering the local river systems (tributaries of the Olifants River) where it is slowly neutralised by dilution and various chemical and biological reactions. However, the water remains highly saline and sulphate concentrations are particularly elevated. An indication of the problem is provided by the rising salinity and sulphate concentration of the water in the Middelburg and Witbank dams (Figures 4 and 5). The problem is exacerbated during dry periods and improves somewhat during wet periods, which is the reason for the high degree of variability in these plots, but the general trend is one of steadily increasing salinity and sulphate concentration. The sulphate concentration in Witbank Dam now regularly exceeds the 200 mg/L level, which is the recommended maximum in water for domestic use. The quality of local water is so poor that ESCOM imports water from the eastern escarpment for use in the power stations in the Witbank-Middelburg area. Ultimately, pyrite in the rocks in these mining areas will be fully oxidised and AMD will cease. There is no indication as to how long this will take, but the problem is likely to persist for centuries rather than decades. As can be seen in Figures 4 and 5, the situation in the Olifants River catchment continues to deteriorate. Attempts were made to install a treatment plant in the particularly heavily polluted Brugspruit area near Witbank, but this has been of limited efficacy. Its main function was to address the pH problem, and it has had no effect on the salinity of the water. A water treatment plant (the eMalahleni Water Reclamation Plant) based on reverse osmosis has been commissioned in the area and has demonstrated that it is possible to treat badly polluted water to drinking quality standards, but the cost of the water is about three times that of water delivered to the area from the Vaal River. Moreover, whilst this technology can produce drinking water for communities, it cannot be used to improve the general state of polluted rivers in the area (the plant has a capacity of 20 mL per day, or 0.23 m3/s, and cost in the region of R300 million when built in 2007). The water quality of the Olifants River will therefore continue to deteriorate in the foreseeable future. There is still a large amount of unmined coal in the Olifants catchment and many prospecting and mining applications await approval (Figure 6), which will undoubtedly lead to further increases in the pollution loads in the future. Although coal mining has been in progress in the upper Vaal River catchment for some time, most of these mines are deep and are still being actively managed. 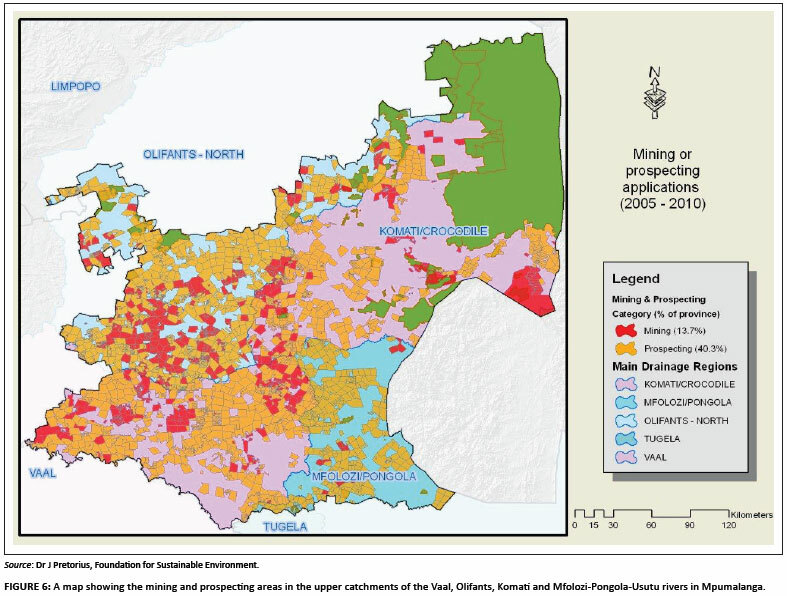 However, a disturbing development has been the proliferation of applications for new mining permits in the catchment (Figure 6). Should these mines go ahead, it is almost certain that the quality of water in the Vaal River will suffer the same fate as that in the Olifants River, and the water in the Grootdraai Dam will, in time, resemble that in Witbank Dam in terms of quality. Water from the Lesotho Highlands will then be the only source of good quality water in the Vaal River system. The Usutu/Pongola and Komati rivers could suffer a similar fate (Figure 6). The government recently announced that it has set aside funds to deal with the looming problem of decanting of water from the Witwatersrand gold mines. This will involve the reestablishment of pumping and basic treatment operations (such as the addition of lime and removal of iron) in the three goldfields currently affected by the problem. The measures will stop the uncontrolled decanting in the Western Basin and prevent similar decanting from occurring in the Central and Eastern basins. Whilst this intervention will greatly improve the situation in the Western Basin, it will have no impact on water quality in the Vaal River system, but will merely return the situation to what it was when the mines were still pumping, treating and releasing water from the mine void. There are many different technologies that have been developed to desalinate polluted water from the local mining areas. Only one of these has been implemented at a commercial scale, namely the reverse osmosis plant at Witbank. This plant has demonstrated that reverse osmosis technology can address the problem, but at a high cost. The financial implications of other technologies have yet to be demonstrated. It is probable that, whereas most of the proposed technologies are suitable for treating point sources of polluted water (e.g. pumped from old mines), it is unlikely that they will be capable of treating polluted water arising from diffuse sources such as waste dumps. In the case of gold mines, the water in the void is generally accessible and can be treated as a point source. The situation in coal mines is more complex and it may never be possible to prevent uncontrolled decanting of AMD from rehabilitated opencast mines. Water quality in such areas can therefore be expected to continue to deteriorate. South Africa is well endowed with vast mineral resources and the wealth created through mining, particularly gold mining, has funded the development of the country. However, as the gold mining industry enters its twilight years we are now beginning to grasp the environmental damage that this industry has caused and will continue to cause in the decades to come. We have also seen the impact that coal mining has had, particularly on water quality in the Olifants River system. The longer-term impacts of these industries, and especially the coal mining industry, are likely to be far more severe in South Africa than in other countries because of our unique combination of geography, climate, population distribution and the scale of the deposits. We must learn from these experiences, especially in respect of coal mining, and carefully examine the wisdom of allowing further coal mining in the catchments of the Vaal River and rivers draining the eastern escarpment. New mines should probably not be permitted in these areas until such time as an economically viable method has been found, either to prevent pollution or to clean up the pollution that will inevitably be produced. As yet, none have been devised that can operate on the scale required by our gold and coal mining industries. Our forebears deferred the environmental costs associated with mining, and we now have to pay those costs. Are we going to do the same to future generations? If we do, their problems are likely to be far more severe than ours because the effects are cumulative and in the future, once mining is on the wane, the funds to address the problem might not be readily available. This review has focused on AMD related to gold and coal mining which is especially affecting the Vaal and Olfiants River systems. These are not the only areas in the country afflicted by this malady, but because of the particular local conditions, the problems in the Olifants and especially the Vaal River basins are huge by comparison and pose a serious threat to future generations of South Africans.